Say hello to little miss Dumplin’, although “little” might be the wrong word. 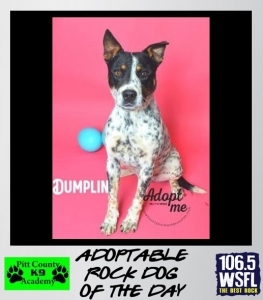 Dumplin’ is a good sized girl who’d love to relocate to your home. She’s an Australian Cattle Dog Mix, about 1-2 years old and her $65 adoption fee includes spay surgery, all vaccines, microchip, and heartworm test. Get more info on Dumplin’ here.